This basic Job template is the first building block in the Talend Cookbook. Other templates will build on this basic Job, with each one introducing new techniques. You may download the BasicJobTemplate and import (Job Designs->Import items) in to a Talend Project of your choice. This download is supported by Talend 5.2.0 and above. This Job includes a General Context Group. 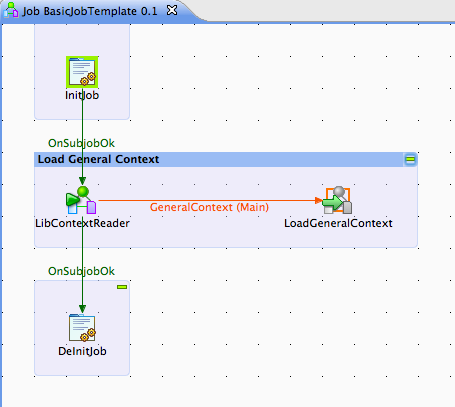 This is intended to hold Context Variables that are required by most, if not all of your Talend Jobs. This group has three Contexts, Default, Test and Production. You may chose to add additional items, depending on your requirements. If you choose to only use the single Default Context, then I would recommend that you leave the others defined but unused. All of the Jobs in this cookbook use this standard arrangement. To add your own task specific components, you will usually disconnect LibContextReader from DeInitJob (OnSubJobOk) and insert your own components. This SubJob loads the General context, as descibed in the the LibContextReader reference.